The court denied defendant's motion in limine to exclude evidence of pre-filing willfulness and rejected defendant's argument that the jury would be "likely to infer willfulness on the basis of ethnic stereotypes, noting that [defendant's] principals are Persian and their manufacturer is Taiwanese." "Essentially, [defendant] argues that unless a litigant has clear evidence of willfulness, a claim of willfulness may not be pursued against a foreign company or a company utilizing a foreign manufacturer as there is an inherent and unavoidable risk that a verdict will be entered against the foreign party on the basis of sheer prejudice alone. [Defendant] presents absolutely no legal support for this argument that claims for willful infringement against foreign companies should be subject to a preliminary assessment to determine the likelihood of success on the merits." Sargent Mfg. Co. v. Cal-Royal Products Inc., 3-08-cv-00408 (CTD July 27, 2012, Order) (Bryant, J.). The court denied defendants' motion to dismiss plaintiff's indirect and willful infringement claims where plaintiff adequately alleged pre-suit knowledge based on the defendants' membership in a defensive patent aggregation service. "[Plaintiff] disclosed its patents and explained how and why they are infringed to [the patent aggregation service] during negotiations [three years ago]. [Plaintiff] further explains that because the 'purpose of [the service] was to obtain patent rights for its members, it is entirely plausible - indeed, likely - that the Company would have identified [plaintiff's] patents to [its member companies], as it did to at least one other [defendant]. . . .' The Court agrees with [plaintiff] that [defendants'] relationship with [the service], in light of [its] business model, provides a plausible basis for reasonably inferring that [defendants] became aware of both patents-in-suit." SoftView LLC v. Apple Inc., et. al., 1-10-cv-00389 (DED July 26, 2012, Order) (Stark, J.). The court denied plaintiff's motion to consolidate three of its cases for pre-trial purposes, but rejected defendants' argument that consolidation would violate the spirit of the America Invents Act. "[T]he Court notes that the America Invents Act remains silent on pre-trial consolidation. As such, the AIA does not affect the authority of a court to order pre-trial consolidation of related patent cases. This Court does not view consolidation in these cases as violative of the spirit of the AIA." CR Bard v. Medical Components, 2-12-cv-00032 (UTD July 25, 2012, Order) (Furse, M.J.). The court granted in part plaintiff's motion for an adverse inference jury instruction where defendants did not disable the auto-delete function in their email program. "Even as litigation with [plaintiff] was 'reasonably foreseeable,' [defendant] kept its auto-delete policy in place at all times. . . . [Defendant] may be right that the record does not establish any bad faith on its part. But bad faith is not the required mental state for the relief [plaintiff] seeks. All that the court must find is that [defendant] acted with a 'conscious disregard' of its obligations. In light of its biweekly automatic destruction policy, [defendant] had a duty to verify whether its employees were actually complying with the detailed instructions [defendant] claims it communicated to them. . . . [A]t all times, [defendant] never checked whether even a single. . . custodian was at all in compliance with the given directives, while at all times the 14-day destruction policy was in place. This is more than sufficient to show willfulness." Apple Inc. v. Samsung Electronics Co. Ltd., et. al., 5-11-cv-01846 (CAND July 25, 2012, Order) (Grewal, M.J.). The court granted in part defendant's renewed motion to compel plaintiff's communications regarding licensing negotiations after plaintiff put the license negotiations in dispute. "[Defendant] brings this renewed motion because [plaintiff] has now – through its response to a Request for Admission and the deposition testimony of its CEO – argued that the rates on one or more of its prior licenses were 'discounted' in light of business decisions. . . . The Court agrees that, following [In re MSTG Inc., 675 F.3d 1337, 1348 (Fed. Cir. 2012)], [plaintiff] is required to produce the emails and letters regarding its licensing negotiations, whether or not those communications could be considered Rule 408 'settlement' discussions. [Its] production should encompass all such communications, not simply those that [plaintiff] believes address 'substantive' terms of the proposed agreements or which touch on the matters [its] CEO testified to." Implicit Networks, Inc. v. Juniper Networks, Inc., 3-10-cv-04234 (CAND July 23, 2012, Order) (Illston, J.). The ALJ denied respondent leave to file its motion for summary determination late even though the motion was filed only a few hours after the deadline. "[Respondent] states that the filing was late because counsel mistakenly believed that the filing deadline was 11:59 p.m. ET, even though counsel acknowledges that the ITC Handbook on Filing Procedures clearly states the following: '. . .the Secretary will consider the document timely filed electronically only if the user has 'clicked' the 'Confirm' button on the final confirmation page for electronic submission by 5:15:59 p.m., eastern time, on the day that the document is due to be filed. . . .' Counsel’s mistaken belief about the filing deadline does not constitute the good cause necessary to accept the late filing. Attorneys practicing before the ITC are expected to know all of the applicable rules of practice." Digital Photo Frames and Image Display Devices and Components Thereof, 337-TA-807 (ITC July 19, 2012, Order) (Rogers, ALJ). The court overruled plaintiff's objection to defendants' claim for video deposition costs. "[Plaintiff] is correct that this Court’s standing order, interpreting Fifth Circuit law, clarified that costs for video depositions were not allowed. However, the standing order issued before the 2008 amendment. . . . The Court finds that § 1920(2) now permits taxing costs for video depositions 'necessarily obtained for use in the case.'. . . In a large patent case such as this, it is common for parties to capture depositions electronically so that they may be used as part of the trial presentation. These cases involve complex technical issues and the needs at trial are often not fully known until the eve of trial. The printed and electronically recorded transcripts were necessarily obtained for use in this case, and Defendants are entitled to costs of both printed and electronically recorded depositions." Eolas Technologies Incorporated v. Adobe Systems Incorporated, et. al., 6-09-cv-00446 (TXED July 19, 2012, Order) (Davis, J.). The court denied without prejudice the parties' applications to file documents related to a motion for preliminary injunction under seal where there was an exceptionally strong public interest. "As evidenced by the plethora of media and general public scrutiny of the preliminary injunction proceedings, the public has a significant interest in these court filings, and therefore the strong presumption of public access applies. . . . [T]he exceptionally strong public interest in the preliminary injunction proceedings in this case merits imposition of the heightened 'compelling reasons' standard that governs the sealing of documents attached to dispositive motions or submitted in trial. . . . While much of the information that the parties sought to file under seal in connection with [plaintiff's] motion for preliminary injunction and [defendant's] motion to stay [pending appeal] may be sealable under the more pliant 'good cause' standard, hardly any of it, save for the exception of some limited third-party source code, satisfies the more stringent 'compelling reasons' standard. Moreover, much of the information may become public in the [related] trial." Apple Inc. v. Samsung Electronics Co., Ltd., et. al., 5-12-cv-00630 (CAND July 18, 2012, Order) (Koh, J.). The court granted defendants' motion for summary judgment of invalidity for indefiniteness of plaintiff's optical diffuser patent following claim construction. "The [patent-in-suit] fails to provide a standard for measuring the difference between a mere modulated surface and a highly modulated surface. In fact, the patent provides conflicting descriptions of the kinds of bumps that comprise a highly modulated surface. . . . As such, the patent fails to provide a person of ordinary skill in the art an objective anchor against which a potentially infringing product may be compared to determine whether the product meets the highly modulated limitation of Claim 1. . . . While [plaintiff] identifies an alleged purpose of a 'highly' modulated surface as being one of hiding structural features of the light source, the specification instead describes that feature only as a potential use of the surface as a component in an LCD display. . . . A potential use is not a purpose. Accordingly, [plaintiff's] attempt to divine objective guidance from the specification via expert testimony does not save the claims from a finding of indefiniteness." Advanced Display Technologies of Texas, LLC v. AU Optronics Corporation, et. al., 6-11-cv-00011 (TXED July 12, 2012, Order) (Davis, J.). The court granted defendant's motion to exclude the testimony of plaintiff's damages expert as to a reasonable royalty based on the expert's application of an unreasonable hypothetical license negotiation. "[T]he Court cannot assume. . . that [defendant], in a hypothetical negotiation with [plaintiff], would have taken a risk on the infringement question and agreed to a huge, profit-eliminating (and even revenue eliminating) royalty obligation for itself. As a matter of law, no such risk can be taken in a hypothetical negotiation in which infringement is deemed known. With knowledge of validity and infringement, such a financially catastrophic agreement would have been totally unreasonable. . . . [A]ny unreasonable negotiating approach must be rejected, since the ultimate goal is to arrive at what the statute terms a 'reasonable royalty.' [Plaintiff's expert's] methodology inherently arrives at an unreasonable result, and one to which no reasonable negotiator for [defendant] could possibly have agreed." WesternGeco LLC v. ION Geophysical Corporation, 4-09-cv-01827 (TXSD July 16, 2012, Order) (Ellison, J.). The court denied defendants' request for a preliminary injunction that would require plaintiffs to "rescind their demand that Apple withdraw [defendant's software application]" from the Apple iTunes App Store. In response to plaintiff's accusations that defendant's App infringed plaintiff's patent, and in the absence of a resolution of that dispute, Apple had removed defendant's App from the App Store. "[Defendant] contends that the total loss and destruction of a business constitutes irreparable harm. However, [defendant] cites to no controlling authority that so holds. Instead, numerous controlling authorities hold that where the injury suffered is a loss of money, irreparable harm cannot be demonstrated. Moreover, the only evidence [defendant] relies upon to factually establish irreparable harm is the declaration [of an employee], in which she states that '[i]f the App is not immediately restored to the iTunes App store, [defendant's] business, which is solely related to selling, upgrading and supporting the App, will be irreparably harmed. [Defendant's] reputation and goodwill among the relevant community will be irreparably destroyed; [defendant] will lose substantial customers and potential customers; and the value of [defendant's] App will be irretrievably lost.' These statements are conclusory and unsupported. . . . [Moreover] [defendant] cannot obtain preliminary injunctive relief because any order entered by this Court would be futile. The only remedy that would provide [defendant] with the outcome it desires and halt the irreparable harm it is allegedly suffering is the reinstatement of the App on Apple's iTunes App Store. This Court does not have the power to afford [defendants] that remedy." Semantic Compaction Systems, Inc., et. al. v. Speak For Yourself LLC, et. al., 2-12-cv-00248 (PAWD July 14, 2012, Order) (Lancaster, J.). The court granted defendants' motion to strike plaintiff's preliminary infringement contentions. "Plaintiff argues that it has sufficiently identified the accused instrumentalities because it has provided a description and there is no requirement that the identification must be by name and model number. Plaintiff has identified the accused functionality and identified exemplars of the products, and argues that this is sufficient . . . However, Plaintiff must address each product separately, and identifying products by functionality is not sufficient. . . . Plaintiff’s general list of products by category or functionality is insufficient, and Plaintiff must provide a list of accused products. . . . Although representative claim charts may be used in the appropriate case, Plaintiff has the burden of establishing that the products in the claim charts are representative of all of the accused products. Here, the products appear to differ from each other or at least fall into two or more different categories." Vigilos LLC v. Sling Media Inc., et. al., 4-11-cv-04117 (CAND July 12, 2012, Order) (Laporte, M.J.). The court reconsidered its ruling made before opening statements and found that defendants were not permitted to present evidence that they no longer planned to commercialize the accused soybean seeds. "The issue was whether Defendants’ current lack of intent to commercialize [the accused seeds] is relevant to [plaintiff's] request for infringement damages. . . . The Federal Circuit has clearly stated that the applicable time frame for the hypothetical negotiation is the time of infringement. Therefore, Defendants’ present intentions concerning commercialization of [their] soybeans are irrelevant and inadmissible under Federal Rule of Evidence 402. Moreover, the Court finds that any remote probative value of this evidence is greatly outweighed by the danger of confusing the jury. . . . The Court, however, will allow Defendants to present evidence that to date, no sale of [that] seed has occurred." Monsanto Company, et. al. v. E.I. Dupont De Nemours and Company, et. al., 4-09-cv-00686 (MOED July 11, 2012, Order) (Webber, J.). The court denied defendant's motion in limine to exclude the testimony of plaintiff's damages expert as to the "revealed preference" theory of lost profits. "[Defendant] moved to exclude [the testimony of plaintiff's damages expert] on the ground that the 'revealed preference' theory is unreliable when calculating lost profits in this case. [Defendant] claims [plaintiff's expert] has conducted no market surveys to support his view that customers who use arm-mounted scanners do not consider non-arm-mounted scanners as a close substitute. . . . While the record is not well-developed, the 'revealed preference' theory appears to be an economic principle cited in the literature. [Defendant] has not demonstrated that revealed preference is an unreliable methodology in the patent context that should be excluded under Fed. R. Evid. 702." Metris USA, Inc., et. al. v. Faro Technologies Inc., 1-08-cv-11187 (MAD July 10, 2012, Order) (Saris, J.). The court granted defendants' motion for monetary sanctions for plaintiff's persistent discovery failures, but denied plaintiff's request for a terminating sanction. "[P]laintiff acted improperly in (1) failing to preserve evidence stored on . . . computers and cell phones, (2) failing to produce promptly and in good faith all responsive documents in the course of discovery, and (3) neglecting to produce as many as 160 additional responsive documents by the court-imposed . . . deadline. . . . [P]laintiff argues not unreasonably that defendants’ prejudice is minimized by the fact that many of the documents produced late appear to be relevant primarily, if not exclusively, to the issue of damages or the value of the patent, rather than infringement, patent validity, or other proper subject of a motion for summary judgment. . . . However, the relative lack of prejudice is counterbalanced by plaintiff’s apparently blasé approach, and its serial failure to timely produce relevant documents. . . . Plaintiff has not engaged in gross discovery violations, but its consistently dilatory and incomplete responses to defendants’ formal discovery requests demonstrate a lack of respect for the process. Plaintiff’s conduct is, therefore, worthy of sanction, although not the drastic sanction of striking part or all of the complaint." NorthMobileTech LLC v. Simon Property Group, Inc., 3-11-cv-00287 (WIWD July 6, 2012, Order) (Conley, J.). The court granted plaintiff's emergency motion to maintain the status quo (i.e., preclude defendant from entering the market) pending plaintiff's appeal of the court's denial of its motion for a preliminary injunction. "[T]he court recognizes that both its infringement and invalidity analyses were premised on the construction of certain key claim limitations. . . . Thus, while the court concluded in its memorandum opinion that 'plaintiff does not hold a valid patent, nor would the defendant infringe if it did,' the court readily acknowledges that the Federal Circuit could disagree with the court's construction of these key limitations and, consequently, its ultimate conclusions. . . . Defendant argues that de novo review of claim construction is not a sufficiently extraordinary circumstance to warrant a stay. The court agrees. However, the court notes that a strong showing of irreparable harm combined with the Federal Circuit's de novo review, can be sufficient. . . . [I]f the Federal Circuit reverses and finds the [patent-in-suit] valid and infringed, plaintiff will suffer irreparable harm if defendant is allowed to even seed the automotive fuel blending market, as said market is intended to account for 100% of its future commercial activity." Butamax (TM) Advanced Biofuels LLC v. Gevo Inc., 1-11-cv-00054 (DED July 6, 2012, Order) (Robinson, J.). The ALJ reaffirmed on remand that complainant's electronic camera patent was invalid as obvious even in light of the secondary considerations of nonobviousness. "[Complainant] has not established a nexus between the [patent-in-suit] and [its] licensing program. . . . I also find it quite telling that [complainant] refused to answer [respondent’s] interrogatories about its settlement discussions with the various licensees that signed licenses resulting from litigation -- [complainant] asserted a Settlement Privilege. I agree with [respondent] that [complainant] cannot have it both ways. That is, [it] cannot assert settlement as a shield in one hand to deny information and then attempt to argue that same settlement as a sword to establish a secondary consideration when it refused to explain what actually went on." Mobile Telephones and Wireless Communication Devices Featuring Digital Cameras, and Components Thereof, 337-TA-703 (ITC June 27, 2012, Order) (Pender, ALJ). The court granted in part plaintiff's motion in limine to exclude the opinion of defendant's damages expert that "doubts about the validity of the patent" created downward pressure on the royalty rates. "Under established law, the hypothetical negotiation approach 'assumes that the asserted patent claims are valid and infringed.' 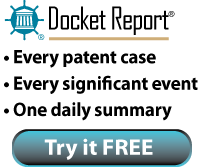 None of the Georgia-Pacific factors includes doubts about the validity of the patent. . . . [Defendant] has not cited a case that has held that this factor allows an expert to doubt the presumption that the patent is 'unquestionably valid and enforceable.'" Metris USA, Inc., et. al. v. Faro Technologies Inc., 1-08-cv-11187 (MAD June 29, 2012, Order) (Saris, J.). The court granted in part defendant's motion for summary judgment that plaintiff's post compile optimizer patent was invalid because the term "means for forming a plurality of data storages areas within said memory area" was indefinite. "[O]ne of skill in the art would understand 'forming a data storage area' to mean allocating memory for data storage. . . . Thus, a software algorithm is required, in addition to the C structure definitions, to form the data storage areas. The specification does not disclose . . . an algorithm for forming data storage areas. [Plaintiff] argues that it is trivial for one of skill in the art to form, or allocate, data storage areas. This argument, however, conflates the enablement requirement under § 112 ¶ 1 with the structural disclosure requirement under § 112 ¶ 6. The fact that one of skill in the art could easily form data storage areas based on the C structure definitions does not absolve [plaintiff] of the requirement to disclose structure when employing means-plus-function claiming." Taylor v. International Business Machines Corporation, 6-10-cv-00615 (TXED July 2, 2012, Order) (Davis, J.). The ALJ granted complainants' motion to terminate the investigation with respect to one patent despite respondents' objections. "The Objecting Respondents oppose the motion, arguing that the possibility of inequitable conduct on the part of the complainant may be a basis for denying a motion for termination. . . . The only support offered by the Objecting Respondents for their requests is [an order in another Investigation]. . . . However, the ALJ determined the facts in that Investigation did not support an immediate termination due to pending motions for summary determination and evidentiary sanctions. Here, the Objecting Respondents have not filed similar motions such that I could find 'extraordinary circumstances' sufficient to warrant denial of [complainants'] motion. . . . Accordingly, I find no extraordinary circumstance that prevents the partial termination of this Investigation." Kinesiotherapy Devices and Components Thereof, 337-TA-823 (ITC June 28, 2012, Order) (Pender, ALJ). The court granted plaintiffs' motion for summary judgment of noninfringement where defendant failed to served infringement contentions. "[Defendant] admits that it has not served infringement contentions with respect to [one of the patents-in-suit], but argues that the only reason it has failed to do so is because [defendant] failed to timely provide it with the source code necessary to formulate those contentions. This statement is made for the first time now, only in opposition to this motion. [Defendant] never previously requested discovery assistance from this Court related to the [patent-at-issue] that it now claims was crucial to meeting its disclosure obligations that passed months ago. . . . [Section 1(f) of the Procedures for Patent Cases -- allowing amendment of contentions 'upon timely showing of good cause'] is not intended for those parties who knowingly disregard a Scheduling Order with the intention of later requesting to amend their infringement contentions to wholesale add contentions related to one patent -- such a request would not be timely or made with good cause (and may, in truth, be an attempt to 'game the system' in order to gain a tactical advantage that prejudices the other side)." SAP AG, et. al. v. Datatern, Inc., 1-11-cv-02648 (NYSD June 28, 2012, Order) (Forrest, J. ).